My good friend Leilani's favorite color is yellow because it's the color of sunshine (and french fries). 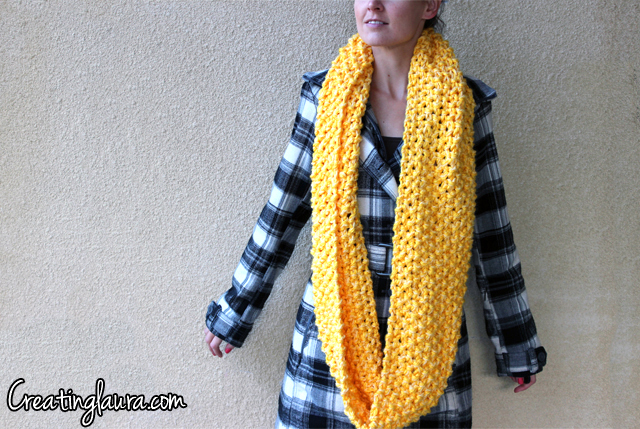 In honor of her birthday, which was on Wednesday, I made her a big, comfy sunshine-colored scarf to help keep her winter days warm and cheery. Throughout this whole pattern, hold the two colors of yarn together and knit with them as if they were one strand of yarn. Line up the cast on edge with the bound off edge and use mattress stitch to make a seam. The scarf should now be one big loop. 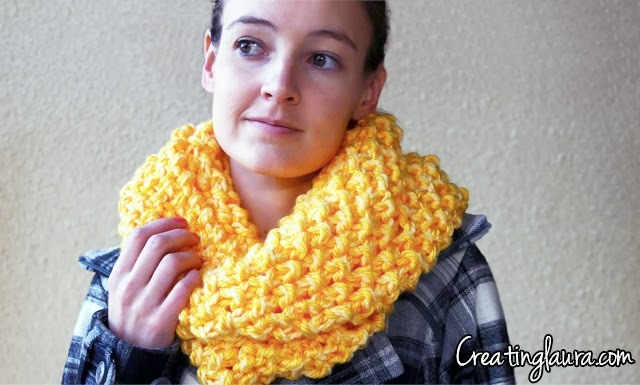 I think seed stitch (the alternating knit/purl technique used in this pattern) is perfect for big scarves like this for two reasons. First, it is reversible so it looks good no matter how it's piled on your neck. Second, all the little purl bumps add volume to the scarf, making it seem even bigger and cozier than it would otherwise. I think Leilani really liked it! Unfortunately, I only had the camera on my phone with me at her party, as I'm sure you can tell. My new goal for myself is to work on remembering to bring my real camera along with me on a more regular basis. I'm sure, Leilani loves her new scarf! 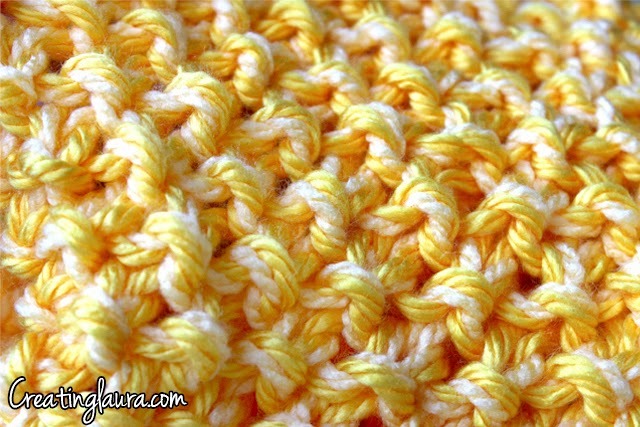 To make it less wide, cast on fewer stitches (in increments of 2 so that you always cast on an even number of stitches). To make it shorter, knit a few less rows so that it will be less than 58 inches long. You do good work girl! So pretty...gonna start one today. Thanks for sharing! I love the Scarf!!!! I have been looking for a really cute pattern and I love yours!!! Would you be able to use this pattern with thinner wool.... not have it quite as thick?? Would you just use a little bit smaller knitting needles then??? I would like to make this using circular needles. Any suggestions on how many stiches to cast on?? Many thanks! Could it be made using an odd number of stitches so each row would be the same and you wouldn't have to remember where you left off when you put it aside? What size needles would you suggest for Sayelle 4 Ply yarn? Maybe size 10 or so? Sorry for the late response! I think 10s would work well. I love this scarf and would like to make it for my mother who will be 100 years old in Nov. Her neck isn't very big so could you please let me know if I can use smaller needles and thinner yarn? The needles are a size 19 in US sizing. What other brand yarn could I use in place of Loops N Threads Baby Charisma as this only comes in pastel shades and the scarf I'm making is Lions Brand bulky in color Barley? Any other brand of yarn will work as long as it's bulky weight. 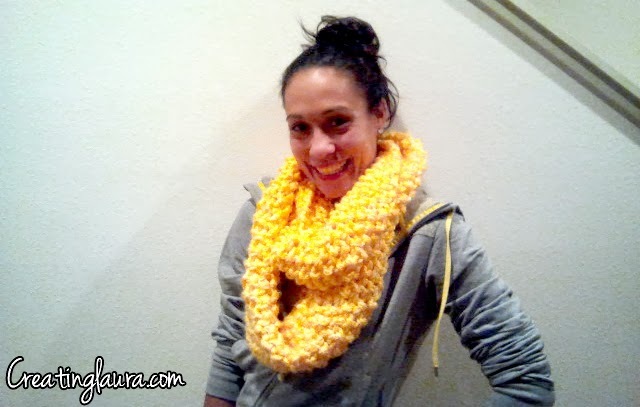 Hey I wanted to make this scarf with just bulky weight yarn from knitpicks, and I think 19 would be overkill. Would you suggest like 12's? I was thinking that or smaller. Thanks! Yep, I think 12s would work. I wouldn't go any smaller than that because it will make the stitches tighter and the scarf stiffer. ok dang, I only have 11s, guess I will have to go shopping! It wouldn't hurt to make a swatch with your 11s before you buy more needles. Maybe you'll end up being happy with it! How wide was the scarf?